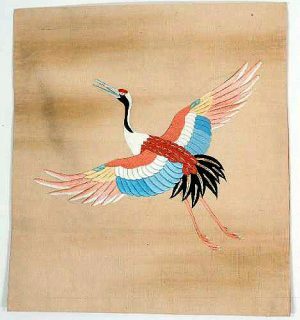 This is a rare, hand woven White Silk (color shown is not white enough) Fukusa that has been hand painted in the “Rice Paste Resist” method whereby each color had to be applied separately while the remainder of the colors were blocked out by the rice paste. 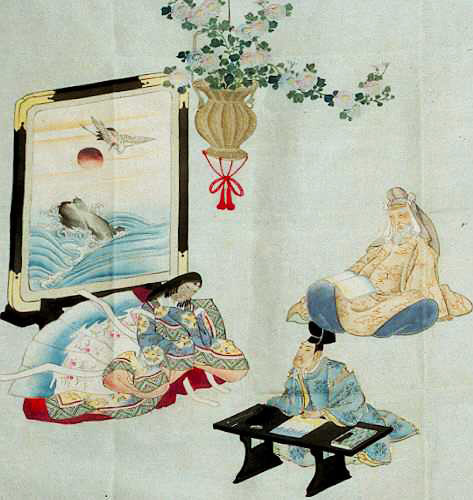 This marvelous genre scene contains an elaborate Ikebana arrangement, a wise man (“Kashiko”) studying, the “Daimyo” or Lord working at his desk, and a 12 layered Kimono clad Beauty sitting in front of a striking screen with a flying Crane (“Tsuru”). This view of daily life comes from The Tales Of Genji, Japan’s oldest novel detailing the complex and ritualistic life at Court in the 11th Century. 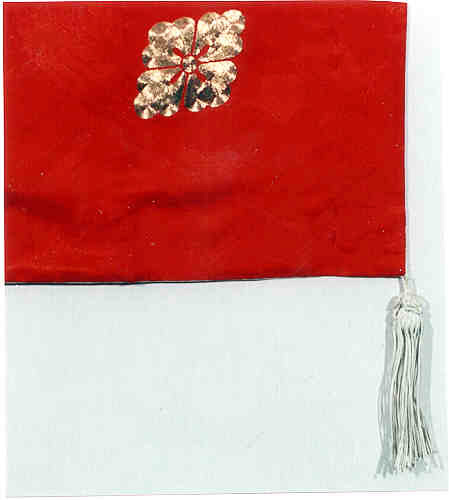 The 4 elaborately hand tied Silk Tassels also date from the Meiji Era and are original to the Fukusa. The art has been further enhanced by the use of pure Gold hand made threads. 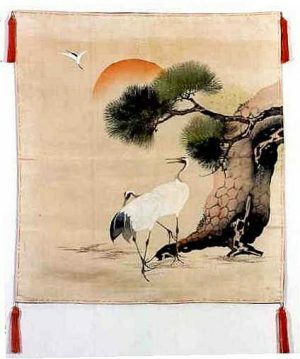 The backing of the Fukusa is a stunning red on red brocade pattern of flying cranes, carrying the propitious use of the Crane from the front of the Fukusa to the back. 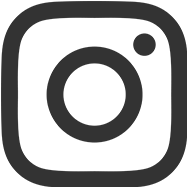 In the bottom right hand corner is the family crest (“Mon”). 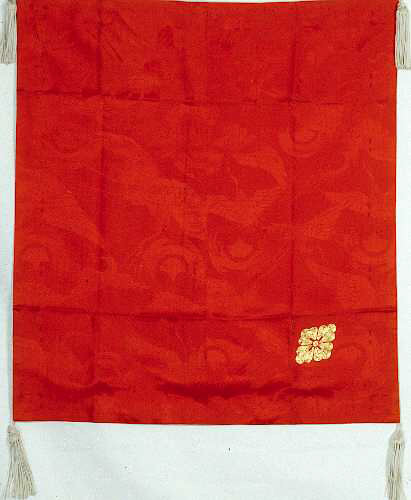 The crest pattern is that of the “Flower Diamond” or “Hanabishi.” It is one of the earliest known textile patterns in Japan and one of the most popular heraldic motifs. A “Fukusa” is a cloth used to cover a gift that has been placed on a wooden or lacquered tray during the gift’s elaborate and formal presentation, all of which followed closely defined rules of etiquette. 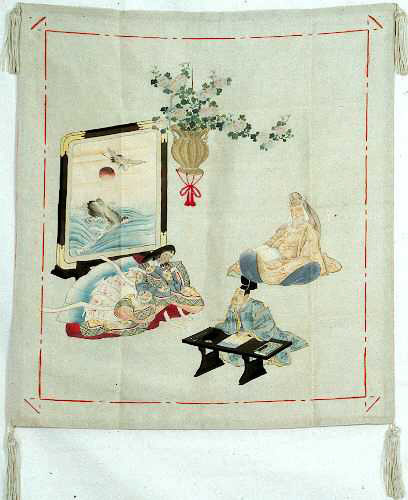 The practice of covering a gift was widespread in Japan before the 1900s. 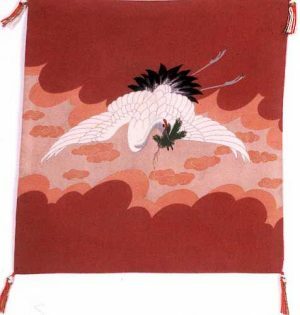 The Fukusa was a valuable family heirloom, as the family itself designed the gift cover to be a thing of beauty. 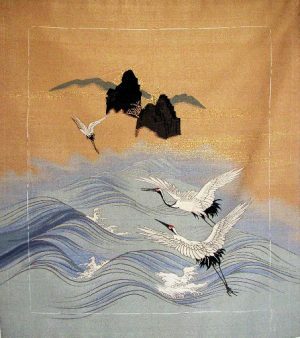 Pure hand woven Silk, hand painted and embroidered, including pure gold thread. These precious threads are prepared by first painting a layer of liquid gold on thin, had made paper, and wrapping it around several threads of Silk. Because of its delicacy, it could not be sewn into the fabric; but was, instead, “Couched” by being laid on top of the fabric, and then hand stitched to it. In excellent condition. 28" wide x 25" high, not including the tassels. Fabulous wall hanging or framed art work. The Fukusa is actually 2 separate sides sewed together at the outer seam with the inclusion of the tassels. 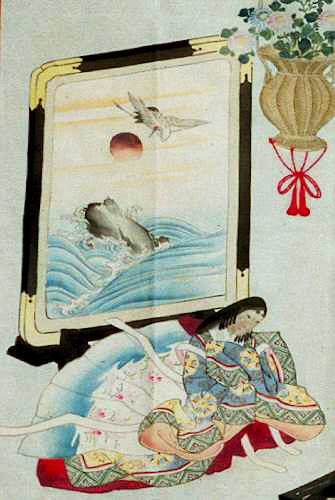 The "Couched" Crest on the reverse side of the Fukusa would also make a dramatic framed work of art.